Talented jazz drummer, Andrew (Miles Teller), is thrilled to be chosen to join a prestigious orchestra at his music school. However, his new mentor and conductor, Fletcher (J. K. Simmons), is extremely tough and will accept nothing less than perfection from his students. How far will Andrew be willing to go in his desire for greatness? How much pressure should a teacher put on his student in the pursuit of perfection? Subscribe To 500 Days Of Film! cranks up the tension again and again to an almost unbearable, pulse racing level. By the end of the film, I didn’t just feel as if I had seen something - I felt that I had experienced something. The two central characters - Andrew and Fletcher - are superbly portrayed. Miles Teller displays a commitment to his role that is just awesome to behold - a truly remarkable physical performance. Meanwhile, J. K. Simmons is astounding as Fletcher. He is wonderful to watch even as he is being terrifyingly brutal. Simmons adds depth and complexity to a character that could, in less capable hands, have become a two dimensional bully. 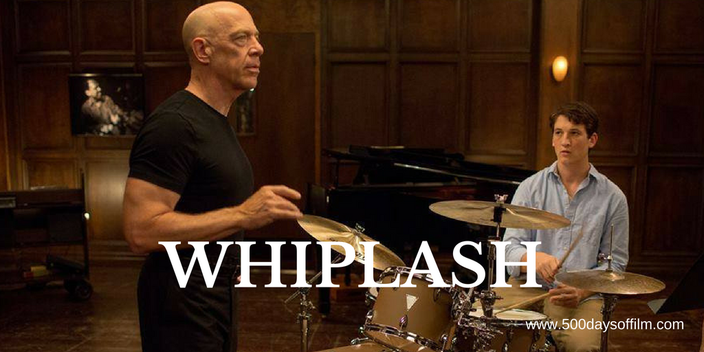 Whiplash explores the fine line that a mentor must tread - to inspire a talented student to reach his or her true potential without pushing that student to breaking point. I cannot recommend Whiplash enough - do see it if you can. I really can’t wait to watch it again. Whiplash was the 100th film in my 500 Days Of Film Challenge!!! J. K. Simmons received a (thoroughly deserved) Oscar for his performance. Whiplash was shot in 19 days with a timetable of 14 hours of filming per day. What did you think about this movie? Did you love it as I do or are you more on team Whiplash Backlash? Whatever the case, let me know in the comments section below!